This is not a pitch. This is a road. No wonder Mickey Arthur looks dead inside. 3 overs left with 8 wickets in hand and run rate barely above 5. SA missed an opportunity here. Looks like SA are 30 to 40 runs short. I heard commentators saying that Pakistan has never lost a match on this ground. Would be great if we chase this down comfortably in like 45 overs! 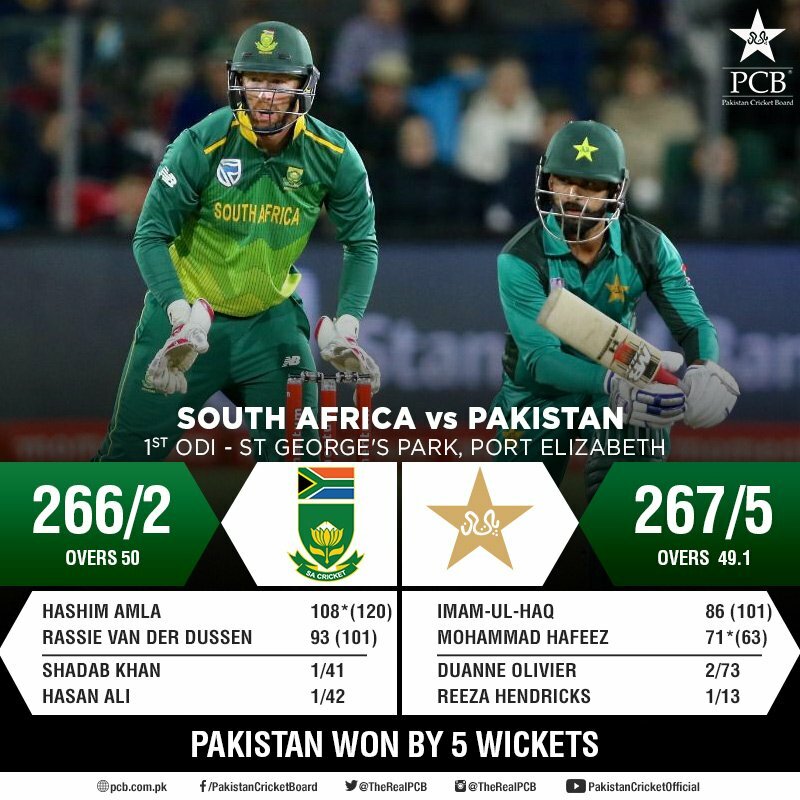 Don't understand the tactics from SA batting when they were 160/1 in 35 overs. They basically hit only 100 in the last 15 overs for 1 wicket because never really pushed consistently into a different gear. We have got pretty much the perfect all-conditions ODI balance in the form of Fakhar and Imam who are our openers. Fakhar is the dasher while Imam is the accumulator. Fakhar's not expected to come off all the time but he'll do what he did today i.e. a quick fire 20-30 while Imam gets his eye in and if he goes on then it's a bonus. Imam gets a bit of criticism for being slow at times but he's bloody consistent. He'll anchor the innings while the other blokes bat around him. Babar is a perfect number 3. Patient enough to anchor the innings but he can also be a dasher to build on a good start from Fakhar/Imam or to accelerate at the end of an innings. Again super consistent. Hafeez and Shoaib Malik have good adaptability and experience. They can read the situation really well. If the top order fails they can rebuild or they can come in and tee off at the end. The beauty of Hafeez is he can also be a floater. If you're only 1 down at the 35 over mark you can almost shove him down the order and promote big hitters. Sarfraz and the all-rounders can absolutely hit the ball miles when required so there's your death overs hitting right there. Even if Pakistan wins this, they'll need to take a long hard look at why these mini-collapses are such an integral part of their game.